If you’ve recently begun researching new cars or have made a new vehicle purchase, then you know how many new safety features come as available options on new cars. It can be hard to know which features are worth the added expense on an already-expensive purchase. 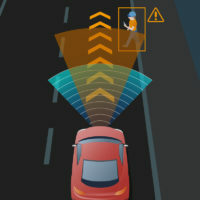 The Insurance Institute on Highway Safety (IIHS) is in the midst of a series of research projects looking at the success of various safety technologies, and has recently released a report showing that lane-departure warning systems provide substantial benefits in the form of car accident and injury reduction. Lane-departure warning systems use sensors installed on vehicles to identify when that vehicle has veered out of its lane, alerting the driver to this fact with vibrations or buzzers. Drivers are thus alerted that they have begun to swerve out of lane before they can become involved in a crash either with opposing traffic or vehicles in a neighboring lane. These systems have not yet become commonplace on new vehicles; only 6% of new models in 2017 offered the feature in their basic package, and 57% offered it as an optional add-on. The report recently released by IIHS described research conducted using the VIN numbers of vehicle models that came equipped with lane-departure warning systems, comparing their crash rates to those of vehicles without these systems. The study found that, when controlling for driver age, location, and other demographic information, vehicles with lane-departure warning systems were involved in 11% fewer crashes of the type prevented with lane-departure warnings, and received 21% fewer injuries from these types of accidents. The results from the study might actually underestimate the effectiveness of lane-departure warning systems. Many drivers find it grating to hear an alarm each time they change lanes, and so they disable the feature. Since the study looked only at the crash rates of vehicles which had the feature installed, and researchers had no way to know whether the driver had disabled lane-departure warnings, it is possible that even more crashes could have been prevented had all drivers kept the systems active. Regardless of lane departure warning systems, the ultimate responsibility lies with the driver to stay alert and change lanes safely. If you’ve been injured in a lane-departure or sideswipe crash in Idaho, find out if you have a right to collect money damages for your injuries by contacting the dedicated and effective Twin Falls personal injury lawyers at Pedersen & Whitehead for a consultation, at 208-734-2552, with additional offices in Boise at 208-336-2552.